The following recipe is simply perfect if you enjoy adding your own creative flair to a superb base dish. Lentils and rice are a staple and with a bit of imagination you can really put some” wow” in this presentation. Traditionally, you can prepare with water. However, you may want to try some different twists on this recipe. Instead of cooking with water, start off with beef, chicken or vegetable stock. This will add a wonderful enhancement to the rice and lentils. Or, for a more sophisticated taste use a nice hearty cabernet wine as your base liquid. From there the possibilities are tasty and tantalizing. This one topped the list of favorites from our grandmother’s recipe book. 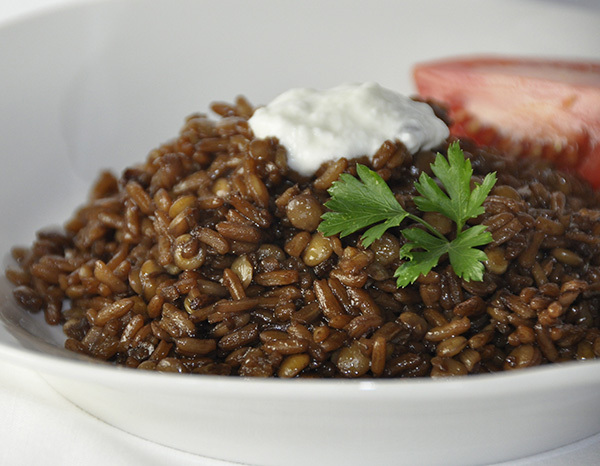 Combine 1 package Jemila Lentils & Rice, 2 teaspoons olive oil and 2 cups of your base liquid of choice. Bring to a slow boil. Decrease heat and cook uncovered for 15-18 minutes. Remove from heat and it’s that simple…it’s time to enjoy!! So easy to serve in the traditional manner with a dollop of unsweetened yogurt. Your family will be sure to enjoy how this healthy side dish compliments and completes the meal. You might even say it “makes the meal”!